Our trampoline mat is made of with 2 mm thickness, hand-woven and knotless double nylon thread: that’s why it is soft to the touch and it does neither scratch nor cause skin injuries when jumping. Double-sided. Once braiding is complete, each mat is stabilised with a special catalyst so as to avoid stretching: it is not elastic, the real elasticity is given by springs! This allows high jump performance and reliability. In fact, thanks to these technical solutions, the jumping mat means less effort to jump, thus reduces the possibility of tiredness accidents. Everyone can use it: children, adults and athletes, without weight limits. Available in two standard sizes or custom-made on demand, our jumping mats are also perfectly suited to trampolines not manufactured by our company. Each professional mat is supplied complete with 108 balanced stainless steel hooks for a quick connection with any spring. Industrie Ricreative guarantees an average useful life of 8-10 years. More and more often in playgrounds we see plastic fabrics or fishing nets stretched with nylon tubes that absorb the elasticity of the springs, straining the user. Our trampoline mats do not require nylon tubes to attach to the springs: the latter are directly applied to the stainless steel hook placed on the perimeter at every 11 cm. On demand we can manufacture jumping mats of different sizes with a maximum length of 436 cm and a maximum width of 213 cm. If your trampoline mat is not produced by our company, please check and communicate the size of the frame and of the springs. Spare springs in hardened steel with 3.2 mm section wire, 28 mm spiral diameter with soft German system hook (non-biconical), galvanized. Replacement cushions for trampolines, completely sealed with 680 g/m² PVC coated polyester lining, sponge and fastening straps. 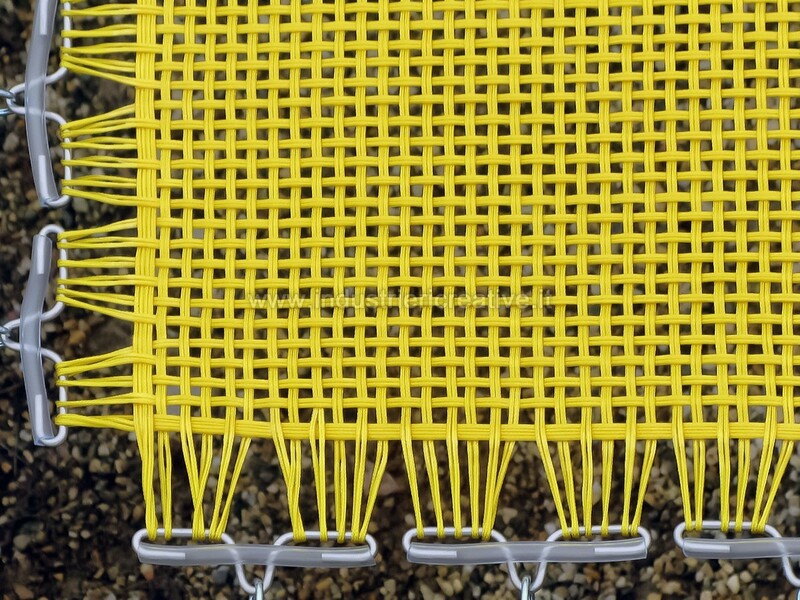 Trampoline net made with yellow nylon (or colour of choice) for “Jumping House” professional single trampoline.